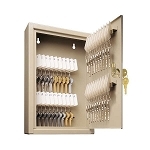 This category includes a wide selection of traditional key cabinets that lock with a key. All of our key cabinets are from the major key storage manufacturers including HPC, MMF, Supra/Kidde and Lund. These key control cabinets are available in sizes ranging from 8 to over 3,000 key capacity. Choose from slotted or hook style models in a variety of configurations. We also offer a couple of services you will not find at most other retailers. First, we will cut additional keys for your cabinet, if you request the additional keys at the time of your order. You will not find that service available at Amazon.
. 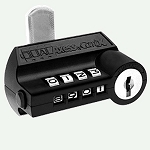 The Compx DualAxess mechanical combination lock with key override.
. The KitLock Electronic Keyless Lock which uses a PIN code rather than a key.
. The KitLock Electronic Lock with Dual Code Access which can require 2 PIN codes for access. 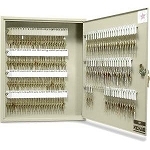 If you already know how you want to store your keys, follow this link to review our Hook Style Key Cabinets or this link for our Slot Style Key Cabinets. If you cannot find what you need, give us a call at (877) 254-5411. We have a very strong network of distributors who can help meet your needs. HPC products not in stock may be available from our distributor.